Reader Larry Marotta has kindly sent me a link to a job currently being advertised working for Police Scotland, thinking I might be impressed with its contents. Indeed I am. The job is for the Head of the force’s new ‘Design Authority’. In case we don’t know what that might be (or why a police force might need one) it is defined as ‘the custodian of the Target Operating Model ensuring alignment to the strategic vision for the organisation taking an end to end view using a business value focused perspective.’ Not surprisingly, the ad has attracted much derision, ably reported here in the Courier and the Sun. Meanwhile, another Police Scotland recruitment campaign, this time for new police officers, has also been rightly criticised. 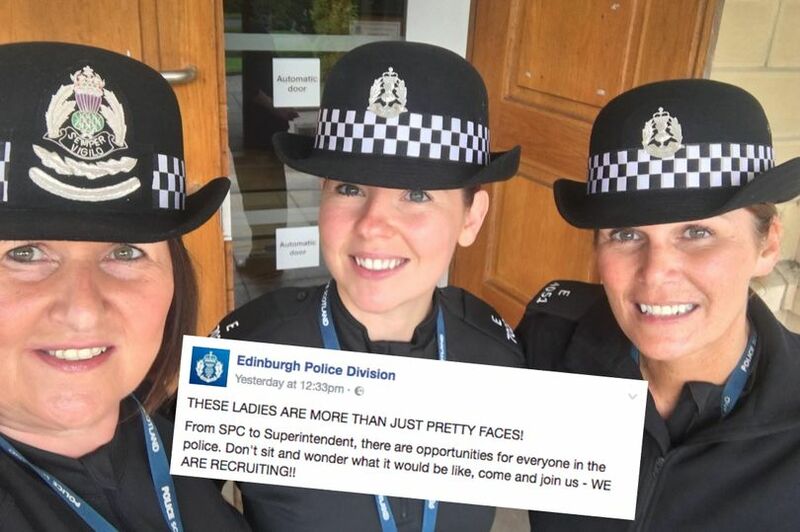 It shows a trio of what would once have been called ‘sonsie lasses’, encouraging more women to join the force with the caption ‘These Ladies are more than just Pretty Faces’. This campaign prompted the Daily Record to dub it with a nice piece of alliteration a ‘Female Force Farce’. When the new Design Authority head is appointed, one of the first things she or he should do is to insist on clear, concise language being used throughout the organisation. Design is all about communicating effectively, and the words used are just as important as the way in which they are displayed. In order to earn that £80K a year, the new person is going to need a heavy-duty broom to sweep away the mountains of HR crap jargon that has obviously built up in the force’s corridors. Good luck to them!